The ahupuaʻa of Mākaha, between Waiʻanae Ahupuaʻa to the southeast and Keaʻau Ahupua‘a to the northwest, extends from the coastline to the Waiʻanae Range. Pukui noted Mākaha means “fierce;” Roger C. Green suggests it relates to “fierce or savage people” once inhabiting the valley. Earliest accounts describe Mākaha as a good-sized inland settlement and a smaller coastal settlement. These accounts correlate well with a sketch drawn by Bingham in 1826 depicting only six houses along the Mākaha coastline. Supporting this, Māhele documents note Mākaha’s primary settlement was inland where waters from Mākaha Stream could support lo‘i and kula plantings. Although there is evidence for settlement along the shore, for the most part, this was limited to scattered, isolated residents. A “cluster” of habitation structures was concentrated near Mākaha Beach, near the Keaʻau side of Mākaha where there is also reference to a fishpond. 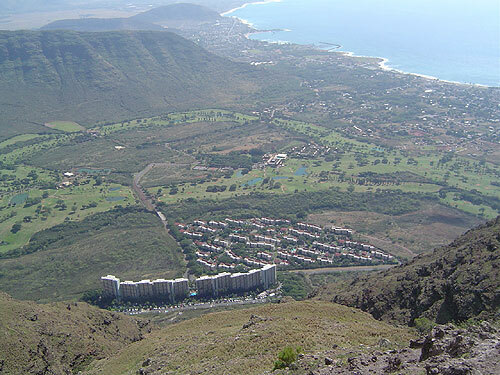 John Papa ʻĪʻī described a network of Leeward O‘ahu trails, which in early historic times crossed the Waiʻanae Range, allowing passage from Central O‘ahu through Pōhākea Pass and Kolekole Pass. The old coastal trail probably followed the natural contours of the topography. With the introduction of horses, cattle and wagons in the 19th century, many of the coastal trails were widened and graded to accommodate these new introductions. The Pu‘u Kapolei trail gave access to the Waiʻanae district from Central O‘ahu, which evolved into the present day Farrington Highway. Kuhoʻoheihei (Abner) Pākī, father of Bernice Pauahi, was given the entire ahupuaʻa of Mākaha by Liliha after her husband, Boki, disappeared in 1829. In 1855, after Chief Pākī died, the administrators of his estate sold the Mākaha lands to James Robinson and Co. Later, in 1862, one of the partners, Owen Jones Holt, bought out the shares of the others. The Holt family dominated the social, economic and land-use activities in Mākaha until the end of the 19th century. During the height of the Holt family presence, from about 1887 to 1899, the Holt Ranch raised horses, cattle, pigs, goats and peacocks. Mākaha Coffee Company bought land for coffee cultivation in the Valley, although coffee never caught on. On Holt’s death in 1862, the lands went into trust for his children. By 1895 the OR&L rail line reached Waiʻanae. It then rounded Kaʻena Point to Mokuleʻia, eventually extending to Kahuku. Another line was constructed through central O‘ahu to Wahiawa. The Holt Ranch began selling off its land in the early-1900s. In 1908, the Waiʻanae Sugar Company moved into Mākaha and by 1923, virtually all of lower Mākaha Valley was under sugar cane cultivation. The plantation utilized large tracks of Lualualei, Waiʻanae and Mākaha Valley. In the 1930s, Waiʻanae Plantation sold out to American Factors Ltd (Amfac.) They started looking for a water source to increase production of the thirsty crop. They tunneled for water; Glover Tunnel, named for the contractor, was 4,200-feet long and had a daily water capacity of 700,000-gallons. The water made available was mainly used for the irrigation of sugar. For a half century, Mākaha was predominantly sugarcane fields. However, by the middle of the century, the operations were no longer profitable and the plantation started to liquidate. In 1946, the Dillinghams announced that they were discontinuing rail service, citing decline in tonnage, rising labor costs and tsunami damage in the system. On October 17, 1946 the stockholders of American Factors (owners of the Waiʻanae Sugar Company) voted to liquidate. Chinn Ho’s Capital Investment Corporation bought the Mākaha lands and looked to resort development in the Valley. He envisioned a travel destination that would be the next Kaʻānapali or even Waikiki, with golf courses, condominiums and hotels. When the Mākaha big surf break was discovered and the eventual Mākaha International Surfing Championship was underway, tourists starting coming to Waiʻanae in the 1950s, as pioneer surfers made Mākaha Beach famous. In 1969, the Mākaha Resort was built, including Mākaha Inn and Country Club, with an 18-hole course with tennis courts, restaurant and other golf facilities was opened for local and tourist use. Over the decades, the resort has had several starts and stops, as well as a number of transfers of ownership. Recent reports note the hotel is in foreclosure and closed, however, golf is open for play on the Valley’s two courses. The image shows a portion of Mākaha Valley. In addition, I have added other images and maps in a folder of like name in the Photos section on my Facebook and Google+ pages.